Sure, these days I write about myself on the internet for trade, but the form of self-analysis wasn’t always my go-to. Growing up, I was never someone who journaled. I kept the occasional diary as a little girl and infrequently published LiveJournal entires as a young teen. But those habits never stuck for long. I’d be gung ho for a few weeks, pouring every emotion out onto the page. But then I’d eventually lose interest and move onto the next thing. About a year ago, though, an astrologer friend suggested I start writing as a form of self care. “It’ll help you work out the thoughts that swirl around in your head,” he said. The advice wasn’t bad—I am prone to overthinking things, after all. But at the time, picking up a journaling habit seemed like just another thing to add to my already full plate. But then two weeks later, I was laid off from my full-time job. I quickly began displaying symptoms of depression. Given that I had no money and no way to support myself, I was unable to stew. I threw myself into work and brushed my emotional turmoil under the rug. This, obviously, was a terrible idea. The sadness didn’t dissipate. Instead, I’d have random outbursts of stress and sadness at extremely inconvenient times. Five months after my layoff, I took a two-week solo trip to Paris. When I landed, all the sadness I’d hoped to leave in New York caught up with me. Since I had no one to talk to, thanks to the time difference and my subpar French skills, I let my emotions flow into the notebook I’d brought with the intention to record what I did during the trip. Journaling my feelings provided me inner peace. My friend was right: Putting pen to paper, it turned out, was the perfect way for me to clear out my mind and improve my mental health. Thinking of picking up the habit yourself? 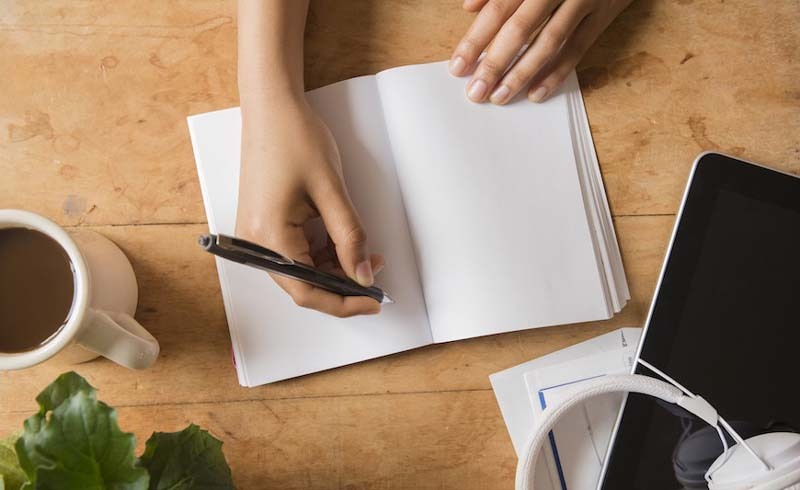 Here are 5 ways journaling can boost your mental health. I used to come up with my best ideas by talking through them with someone else. A kernel of a thought would suddenly pop into something bigger when I spoke about it with someone else. Journaling allows me to complete that same task, just without having the other person to bounce ideas off. Now when I have a problem, I write it out, and by the time I’m done explaining it, I’ve usually worked my way through a bunch of possible solution scenarios. Having my thoughts in writing allows me to see them from a bird’s-eye view. It’s kind of like turning all pieces of a jigsaw puzzle to be picture-side up: Laying out all the options in a visible way makes assembling the end product way simpler. Part of the reason I think journaling didn’t work for when I was younger was because I tried to stick to a rigid schedule of writing things down. Every night I’d force myself to get some thoughts down. I realize now doing so makes me feel boxed in. Some days, I simply don’t have anything to write about, so now I only write when I feel I have something to say, or work out, or remember for later. Instead of being one more thing for me to do in my already hectic life, journaling now seems like an escape for me. So when I’m stressed, it’s a relief—not a burden. Being able to literally check off goals makes satisfying them so much sweeter. It also helps me to realize how far I’ve come. Reading through my old entries helps me realize how capable I am at reaching goals I set for myself—because I have evidence that I’ve accomplished doing so. Reading through my old entries helps me realize how capable I am at reaching goals I set for myself—because I have evidence that I’ve accomplished doing so. That sense of pride, in turn, motivates me to keep moving forward, and to keep taking time out for myself to journal, since the process is obviously working for me. That, in turn, has helped me work toward yet another goal—putting together my first book of essays. Trying to keep your emotions tucked away is like putting them in a pressure cooker. Before I started journaling, I’d have straight-up outbursts rather than healthy emotional responses to triggers. I’d call my mother screaming. I’d cry in public. I’d type out long, rambling Twitter rants. You get the picture. Now, if I feel things…percolating, I pull out my journal and just start writing. I keep it in my backpack in order to do this whenever the mood strikes. Sometimes, my emotional stream of consciousness doesn’t make sense, but putting it down on paper gets it out of my brain and keeps it from overtaking the rest of my day. And once issues are on paper, they tend to seem so much smaller, and much easier to deal with. I used to quiz all of my friends and family on how to broach any given situation. I’d yank them through every possible scenario, and question them over and over about whether or not they thought I was making the right decision. 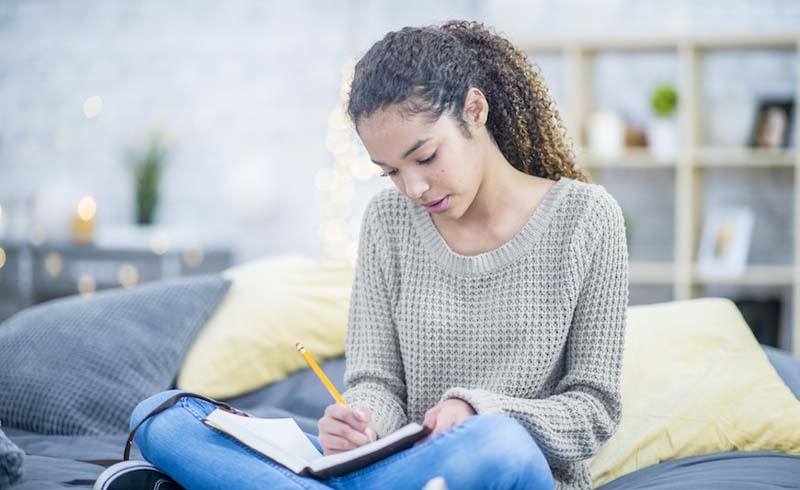 But journaling has shown me that I possess the tools to help myself; I don’t have to worry about anyone else when it comes to making decisions for my life and my mental health.